Bennett Fracture-Dislocation involves a break/fracture in the base of the thumb metacarpal bone and an associated dislocation or subluxation of the metacarpal bone out of its normal position in the joint at the base of the thumb. This joint at the base of the thumb is called the carpometacarpal (CMC) joint or Basal Joint. The basal or trapeziometacarpal joint (CMCJ) dislocation may occur without a fracture. It is a very mobile joint and provides much of the range of motion enjoyed by your thumb. 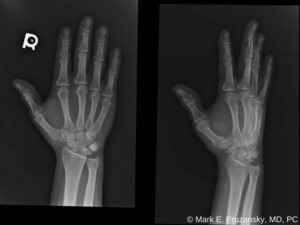 The fracture is named after Dr. Edward Hallaran Bennett, an Irish surgeon who lived in the 19th century and was the first to describe the appearance of the fracture on x-ray. Pain, swelling, and bruising at the base of the thumb is common. Trying to move your thumb will be painful and difficult. This injury is common in contact sports like football and boxing. A fall onto your thumb can also result in this type of fracture. 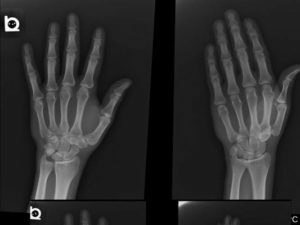 A careful physical exam and an x-ray of the hand are essential to make the diagnosis. The x-ray will provide detail about the size and location of the fracture fragments and the status of the joint. The size of the fractured piece of bone, how far it has moved out of place, and whether or not the joint is dislocated are some of the main factors determining the type of treatment. The goal of any treatment is to improve the anatomy of the bone and CMC joint. Sometimes the fractured bone and dislocated joint can be put back into their correct position manually and held in place with a splint or cast. The splint or cast is usually worn for 4 – 6 weeks. In other cases, surgical intervention is necessary to reassemble the pieces of the joint to minimize the possibility of arthritis. 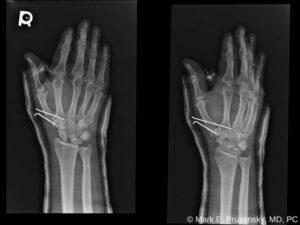 Temporary fine metals pins are typically used to hold everything in place, while a splint or cast provides additional protection. Bennett Fracture-Dislocation can be a disabling injury to your hand. 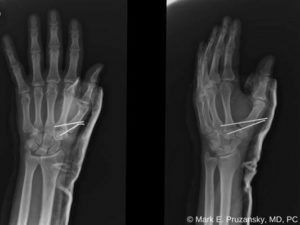 Call Hand Surgeon Dr. Pruzansky at 212-249-8700 to schedule an appointment and improve the use of your thumb.